Scientists say they have developed a fabric that can harvest body heat to power small wearable electronic devices such as activity trackers. Many wearable biosensors, data transmitters and similar tech advances for personalised health monitoring have been “creatively miniaturised,” said Trisha Andrew from the University of Massachusetts Amherst in the US. However, they require a lot of energy, and power sources can be bulky and heavy, said Andrew. The research, published in the journal Advanced Materials Technologies, describes that in theory, body heat can produce power by taking advantage of the difference between body temperature and ambient cooler air, a “thermoelectric” effect. Materials with high electrical conductivity and low thermal conductivity can move electrical charge from a warm region towards a cooler one in this way. Some studies have shown that small amounts of power can be harvested from a human body over an eight-hour workday, but the special materials needed at present are either very expensive, toxic or inefficient, researchers said. “What we have developed is a way to inexpensively vapour-print biocompatible, flexible and lightweight polymer films made of everyday, abundant materials onto cotton fabrics that have high enough thermoelectric properties to yield fairly high thermal voltage, enough to power a small device,” Andrew said. 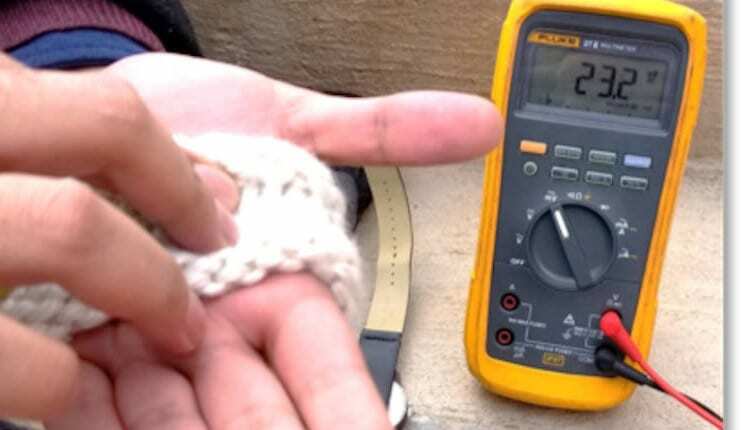 The researchers took advantage of the naturally low heat transport properties of wool and cotton to create thermoelectric garments that can maintain a temperature gradient across an electronic device known as a thermopile. The device converts heat to electrical energy even over long periods of continuous wear, researchers said. This is a practical consideration to insure that the conductive material is going to be electrically, mechanically and thermally stable over time, they said. “Essentially, we capitalised on the basic insulating property of fabrics to solve a long-standing problem in the device community,” the researchers said. “We believe this work will be interesting to device engineers who seek to explore new energy sources for wearable electronics and designers interested in creating smart garments,” they said. The researchers created their all-fabric thermopile by vapour-printing a conducing polymer known as PEDOT-Cl onto one tight-weave and one medium-weave form of commercial cotton fabric. They then integrated this thermopile into a specially designed, wearable band that generates thermo-voltages greater than 20 milliVolts when worn on the hand. The researchers tested the durability of the PEDOT-CI coating by rubbing or laundering coated fabrics in warm water and assessing performance by scanning electron micrograph. The researchers measured the surface electrical conductivity of the coatings using a custom-built probe and found that the looser weave cotton demonstrated higher conductivity than the tighter weave material. The conductivities of both fabrics “remained largely unchanged after rubbing and laundering,” they said. Using a thermal camera, they established that the wrist, palm and upper arms of volunteers radiated the most heat, so the researchers produced stretchy knitted bands of thermoelectric fabric that can be worn in these areas. The air-exposed outer side of the band is insulated from body heat by yarn thickness, while only the uncoated side of the thermopile contacts the skin to reduce the risk of allergic reaction to PEDOT-CI, the researchers said.